From the bestselling authors of How to be Parisian, what smart, savvy, fabulous French women think, feel and advise as they hit forty on life, love, and everything else Older, but Better, but Older has the playful wit, self deprecation and worldly advice we have come to expect from these bestselling authors, but now that advice is focused on the French woman's mindset as she hurtles towards forty. Caroline de Maigret and Sophie Mas are back to amuse you with how they find they are modifying their favorite bad-girl behavior as they address beauty, love, seduction as well as lifestyle, family, work, and living alone. They are still bohemian iconoclasts saying what you don't expect to hear. They will tell you things aren't what they used to be--when a thirty-year-old guy arrives at a party and does not even glance at you; when you wake up feeling great and everyone tells you how tired you look; you know you're an adult when you're excited just to go home. Neuroses vs. confidence, resistance vs. acceptance, passion vs. serenity, de Maigret and Mas through spirited short stories capture the different stages of ageing--as nostalgic but modern Parisian women. From the privately absurd to the strangely universal, this book captures moments of everyday life that will make the reader nod, cringe, and laugh out loud. 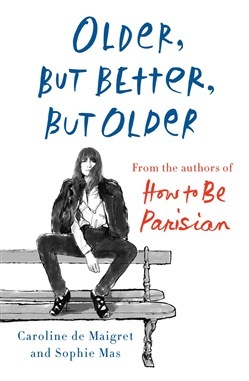 Acquista Older, but Better, but Older in Epub: dopo aver letto l’ebook Older, but Better, but Older di Caroline de Maigret, Sophie Mas ti invitiamo a lasciarci una Recensione qui sotto: sarà utile agli utenti che non abbiano ancora letto questo libro e che vogliano avere delle opinioni altrui. L’opinione su di un libro è molto soggettiva e per questo leggere eventuali recensioni negative non ci dovrà frenare dall’acquisto, anzi dovrà spingerci ad acquistare il libro in fretta per poter dire la nostra ed eventualmente smentire quanto commentato da altri, contribuendo ad arricchire più possibile i commenti e dare sempre più spunti di confronto al pubblico online.